Although TLT sounds complicated, it uses our existing FDA-cleared, high-power, near-infrared lasers in a new manner. It's a fast, non-drug treatment for PTSD and non-acute TBI. A new and promising research study involving the Manhattan Beach Protocol for TLT treatment of PTSD and TBI is now available. For more information about the Manhattan Beach protocol of high-dose transcranial laser therapy in PTSD, TBI, and CTE, please go to the inquiry form. Using our advanced treatment protocol, we have achieved a 95% reduction in the symptoms of PTSD and TBI. Here is a graph of a patient's scores on a measure of PTSD and depression. It shows that even 4 months after treatment, the improvement "sticks." 1 in 5 vets from our Iraq and Afghanistan wars have PTSD. Sadly, veterans account for 1 in 5 suicides. More than $2B has been spent on veterans' PTSD. Often, it helps, but results are sporadic and often incomplete. Most of the time, though, the 700,000+ vets with PTSD will not receive treatment. Current treatments are estimated to cost $5000 or more PER YEAR. With current treatments, we would have to spend $70 Billion to give all the vets with PTSD treatment for the next twenty years. And not all of them would benefit. 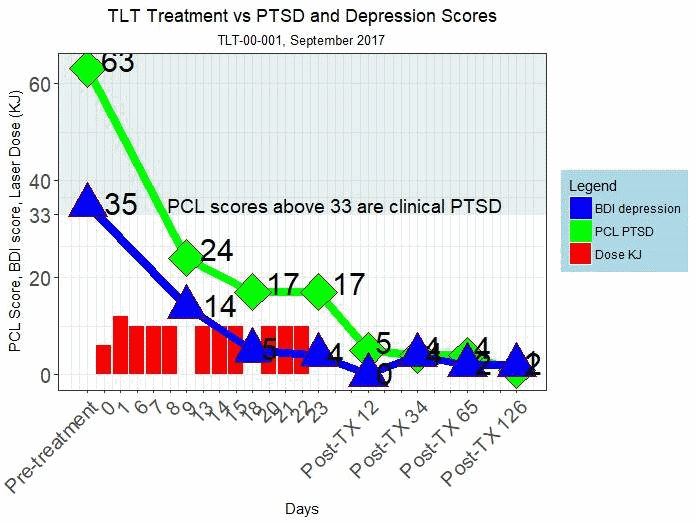 In 2015, a Denver group reported their results from a series of ten patients with PTSD & TBI treated with TLT. Using TLT with the "Denver protocol," the results are very impressive. Sleep is the body's natural PTSD salve, helping with the consolidation of fear extinction memory. Nightmares and insomnia interfere with this process. A vicious cycle can occur, with sleep disturbances exacerbating PTSD, which in turn exacerbates sleep disturbances. There are two protocols in use, the Denver and the Manhattan Beach protocols. Each patient's therapy is individually determined, and is based on either the Denver or Manhattan Beach protocol. These protocols serve as the standard, but each individual treatment plan may vary. The Manhattan Beach protocol uses higher laser power, more total Joules of laser, and more rapid treatments. The results from treatment with the Denver protocol suggests that higher total Joules results in more improvement in depression. However, the sample size is too small to be statistically significant. As the following chart shows, the relationship between total Joules and depression improvement needs further investigation to determine the dose-response curve. The standard Denver protocol is 2,400 - 3,000 Joules per treatment per location. In each session, 2-3 locations are treated. 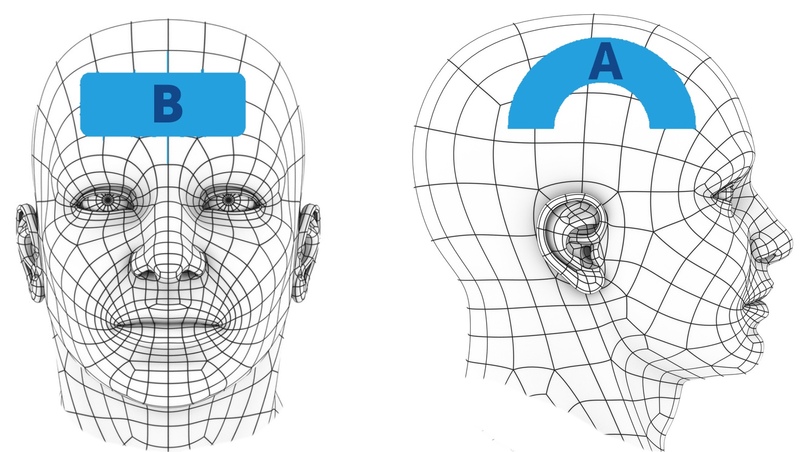 Both temporal/cortical areas "A" are always treated, and in some patients area "B" is also treated. There are either 10 or 20 sessions, one per week, for 10-20 weeks. Total Joules are 50,000 - 180,000. The therapy is a 10 Watt, 10 Hz pulsed beam from an 810/980 nM LiteCure laser. The Manhattan Beach protocol is 3,000 - 7,500 Joules per treatment per location. In each session, 3 locations are treated. 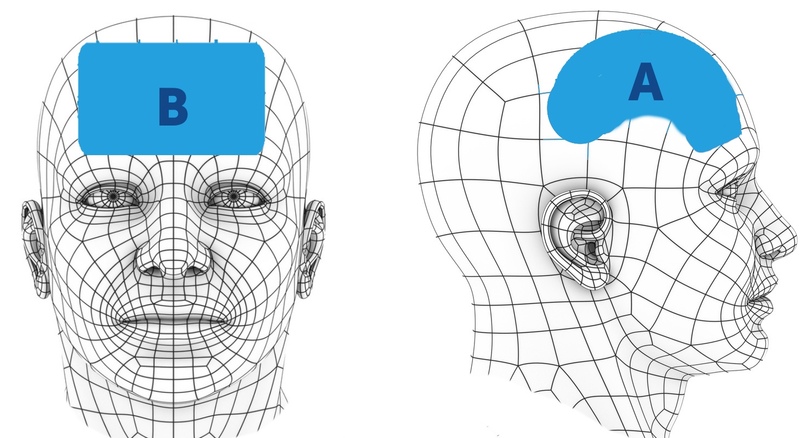 Both temporal/cortical areas "A" and area "B" are treated, but both areas are expanded somewhat compared with the Denver protocol. There are 2-5 sessions per week over 2-4 weeks. Total Joules are 80,000 - 300,000. The therapy is a 15-25 Watt, continuous or 10 Hz pulsed beam from an 810/980 nM LiteCure laser. The most important report to date for using TLT to treat PTSD and TBI is "Treatments for traumatic brain injury with emphasis on transcranial near-infrared laser phototherapy", the sentinel article by Morries, Cassano, and Henderson. 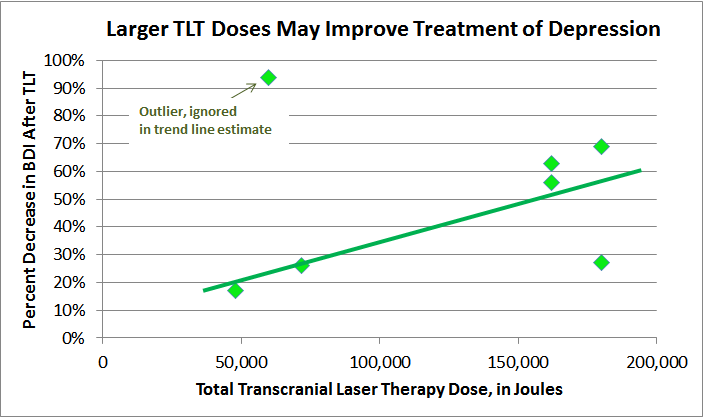 They treated 10 patients with TBI/PTSD with high-power 10 W laser 810/980 nm, with outstanding results, as illustrated in the graphs in other sections. To understand the scientific underpinnings of why this therapy should work, requires examining five overlapping areas: (1) The neuroanatomy and neurocircuitry of PTSD and TBI, (2) the overlap of PTSD and TBI, (3) numerous animal studies showing the benefits of laser light in animal models of TBI, (4) basic neuroanatomy as it relates to (1) and to the A-B areas in the Denver and Manhattan Beach protocols, and (5) what kinds of lasers are able to penetrate the human skull into the cortex. B. Theeler, S. Lucas, R. G. Riechers, and R. L. Ruff, " Post-traumatic headaches in civilians and military personnel: a comparative, clinical review ," Headache, vol. 53, no. 6, pp. 881-900, Jun. 2013. C. J. Bryan and T. A. Clemans, " Repetitive traumatic brain injury, psychological symptoms, and suicide risk in a clinical sample of deployed military personnel ," JAMA Psychiatry, vol. 70, no. 7, pp. 686-691, Jul. 2013. D. X. Cifu, B. C. Taylor, W. F. Carne, D. Bidelspach, N. A. Sayer, J. Scholten, and E. H. Campbell, " Traumatic brain injury, posttraumatic stress disorder, and pain diagnoses in OIF/OEF/OND Veterans ," J Rehabil Res Dev, vol. 50, no. 9, pp. 1169-1176, 2013. H. Bono, S. Kawano, H. Ono, and T. Takagi, " Tutorial videos of bioinformatics resources: Online distribution trial in Japan named TogoTV ," Briefings in bioinformatics, vol. 13, no. 2, pp. 258-68, 2012. J. Khuman, J. Zhang, J. Park, J. D. Carroll, C. Donahue, and M. J. Whalen, " Low-level laser light therapy improves cognitive deficits and inhibits microglial activation after controlled cortical impact in mice ," J. Neurotrauma, vol. 29, no. 2, pp. 408-417, Jan. 2012. K. Krysinska and D. Lester, " Post-traumatic stress disorder and suicide risk: a systematic review ," Arch Suicide Res, vol. 14, no. 1, pp. 1-23, 2010. M. A. Naeser, R. Zafonte, M. H. Krengel, P. I. Martin, J. Frazier, M. R. Hamblin, J. A. Knight, W. P. Meehan, and E. H. Baker, " Significant improvements in cognitive performance post-transcranial, red/near-infrared light-emitting diode treatments in chronic, mild traumatic brain injury: open-protocol study ," J. Neurotrauma, vol. 31, no. 11, pp. 1008-1017, Jun. 2014. N. Mitsuhashi, K. Fujieda, S. Kawamoto, K. Okubo, T. Takagi, and T. Tamura, " BodyParts3D: 3D structure database for anatomical concepts ," Nucleic acids research, vol. 37, no. Database issue, pp. D782-5, 2009. Q. Wu, W. Xuan, T. Ando, T. Xu, L. Huang, Y.-Y. Huang, T. Dai, S. Dhital, S. K. Sharma, M. J. Whalen, and M. R. Hamblin, " Low-level laser therapy for closed-head traumatic brain injury in mice: effect of different wavelengths ," Lasers Surg Med, vol. 44, no. 3, pp. 218-226, Mar. 2012. R. A. Lanius, R. L. Bluhm, and P. A. Frewen, " How understanding the neurobiology of complex post-traumatic stress disorder can inform clinical practice: a social cognitive and affective neuroscience approach ," Acta Psychiatr Scand, vol. 124, no. 5, pp. 331-348, Nov. 2011. T. Nagaoka, E. Kunieda, K. Sakurai, M. Taki, S. Watanabe, S. Watanabe, and Y. Yamanaka, " Development of realistic high-resolution whole-body voxel models of Japanese adult males and females of average height and weight, and application of models to radio-frequency electromagnetic-field dosimetry ," Physics in medicine and biology, vol. 49, no. 1, pp. 1-15, 2004. W. Xuan, T. Agrawal, L. Huang, G. K. Gupta, and M. R. Hamblin, " Low-level laser therapy for traumatic brain injury in mice increases brain derived neurotrophic factor (BDNF) and synaptogenesis ," J Biophotonics, vol. 8, no. 6, pp. 502-511, Jun. 2015.
" In military and veteran populations, trials of the first-line trauma-focused interventions CPT and prolonged exposure " .
" These findings suggest that alterations of white matter integrity in PCG link to mnemonic and affective processing in PT ." .